ener-G-save is a philanthropically funded energy efficiency project in the Pioneer Valley. It is the brainchild of Harold Grinspoon, a Springfield philanthropist who for more than 2 decades has supported varied educational initiatives, young entrepreneurs, and regional farmers. More on Harold Grinspoon and his work here. ener-G-save sees local energy conservation as an important lever to help people spend less on utilities and be more comfortable in their homes, while creating local jobs and reducing greenhouse gas emissions. Together with partnering towns, grassroots groups, businesses, faith communities and contractors we help homeowners navigate and take full advantage of existing utility incentives for energy efficiency as well as consult them, if they wish, on further steps they can take to save money, energy and carbon emissions. Through a one stop hotline (413-279 9141) or by filling out our online form, ener-G-save helps all homeowners access pre-screened contractors and financial incentives to determine which kind of work and which financial help makes the most sense in each particular case, making it as easy as possible to follow through on good intentions! New in 2018/19 is our Cooler Community Education project, currently being developed. More on the latest about it here. 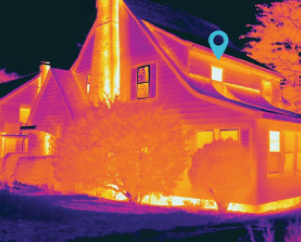 In 2016 Harold learned about a newly-developed thermal imaging technology that can identify energy leaks quickly and cost effectively, he founded the Harold Grinspoon Charitable Foundation Energy LLC, and decided to make its first project the use of thermal imaging technology to educate and inspire Pioneer Valley home owners to reduce energy use. The Foundation hired Essess, a Massachusetts company founded by MIT scientists, to collect thermal imaging data on 100,000 homes in the Pioneer Valley, using cars with roof-mounted thermal imaging cameras. Essess analyzed the data collected to determine which Pioneer Valley homes stand to benefit the most from energy saving retrofits, such as insulating walls and attics, air sealing windows, doors, foundations, and soffits, and replacing old heating and cooling equipment. In partnership with 10 Pioneer Valley towns, the foundation sent individualized letters to those homeowners whose homes were identified as the most promising for energy efficiency improvements. These letters include the thermal image of each homeowners house. ener-g-save is no longer providing these images, although some contractors use thermal cameras to check spots in the home. During our pilot year, ener-G-save reached over 1,600 homes.